Enjoyable read from both the history and faith side of the ball. 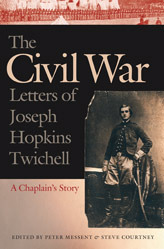 A congregational preacher, Twichell was a little out of comfort with many of his charges, many of his men were Catholic and his commander (gasp) a Episcopalian. He writes well and on subjects from faith to military matters to politics and daily life. Worth reading.